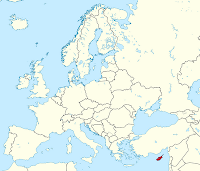 Cyprus is a small island, situated in the north-eastern part of the Mediterranean Sea. It lies 75 km south of Turkey, 105 km west of Syria, 380 km north of Egypt and 380 km east of Rhodes (Greece), at the crossroads of Europe, Africa and Asia. 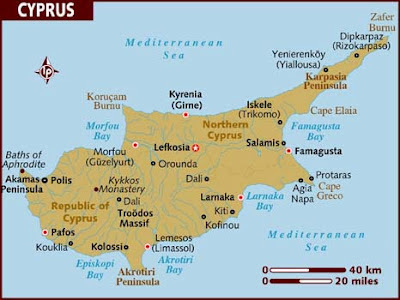 Cyprus gained its independence from British colonial rule in 1960. 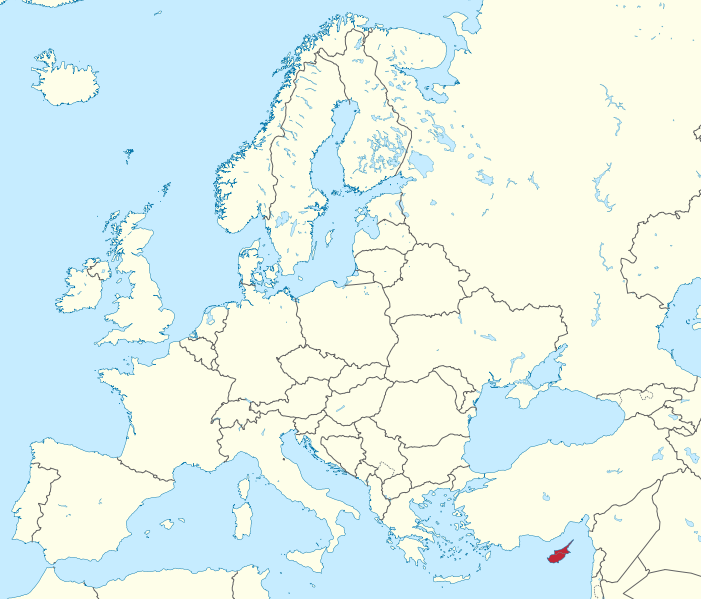 In 1974 Turkey invaded Cyprus and occupied 36,2% of its sovereign territory. The ceasefire line runs right across the island and cuts through the heart of the capital Nicosia, dividing the city and the country. The natural wealth of the island is the result of the changes of nature through time, and particularly ground and climate conditions, the adjacency with three continents, the long-lasting isolation as an island, as well as the effect of the human factor. The Cypriot variety of landscapes, such as mountains (the Pentadaktylos and the Troodos massif), fertile plains (Mesaoria), valleys, cliffs, gorges, caves, steep coasts, as well as the local climatic variety, helped in the creation of abundant biotopes. Cyprus is at a crossroads of civilizations and a bridge between cultures. It has been conquered by many powers at various periods and has managed to assimilate various cultural influences. Dispersed throughout its territory are historic and religious monuments of varying styles, themes and philosophies. The major environmental problems in Cyprus are droughts, forest fires, water pollution and shortage, waste, coastal degradation, erosion, and loss of biodiversity. The small size of the island, the dry climate and intense pressures from tourism result in problems highly specific to the country. However, in recent years the state of the environment has improved due to new legislation in the Greek part. The Turkish part shows more environmental problems than the Greek part, although some pressures (e.g. tourism) are less. The main air quality issues include control of mobile and stationary air pollution sources, provisions for public information/notification when thresholds are exceeded, establishment of a coordinated monitoring program and assessment of air pollution-related health effects. Water quality issues include ground water nitrate contamination from agricultural sources, marine environment pollution and water quality monitoring. Furthermore, Cyprus has to deal with seasonal disparity in rainfall, no natural reservoir catchments, and sea water intrusion to island's largest aquifer, water pollution from sewage and industrial wastes. All of Cyprus' urban and rural dwellers have access to safe water. Waste-related issues for Cyprus include hazardous waste from mining and other industrial operations, solid waste management including both human and animal waste management and waste management policy. Another environmental concern is erosion, especially of Cyprus' coastline. In accordance with the Foreshore Protection Law, several coastal areas have been zoned to prevent undesirable development. 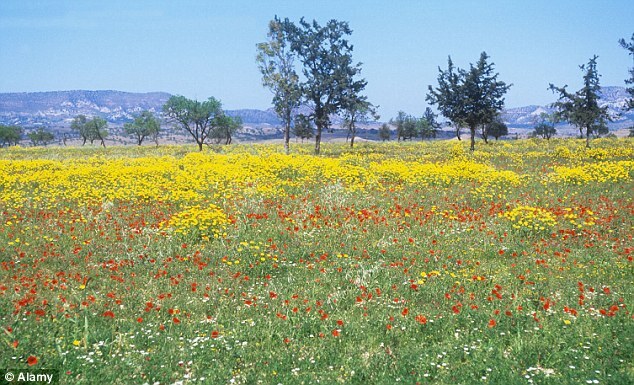 The expansion of urban centers threatens the habitat of Cyrpus' wildlife. As of 1994, one mammal species, 17 types of birds and 43 plant species in a total of 2,000 are threatened with extinction. About 20 species of flora are protected. The Cyprus mouflon is protected. Conservation laws seek to preserve forests, restrict the hunting of wildlife, and maintain environmental health. Climate change is having an urgent effect on water levels in Cyprus. Rainfall has decreased by 20% since 1972, and water reservoirs are only at 9% capacity or less. Due to the lack of rainfall, drought and desertification have become significant problems and are impacting agriculture in the once fertile area. Cyprus has been forced to use reservoirs and desalination to provide water to its residents. Groundwater resources are being overexploited mainly for agriculture and domestic use. Being an island Cyprus is also exposed to sea level rise. Civil society in the Greek Cypriot community has to cope with control from political parties, and clientilistic relationships between political parties and citizens. The Greek Cypriots tend to think that almost everything has a political cause and that is the role of politicians to deal with almost all issues facing society. Political power, as exercised by the state and political parties, therefore assumes a hegemonic role, controlling not only the economy but also society at large, as is evident in education, the media, cultural production and volunteer organisations (mainly charities), and resulting in the underdevelopment of civil society. A disappointing 80.4% of the population does not belong to any social organization. Voluntary assistance to social organisations remains low and creates serious problems to the efficient operation of many organisations. In the last few years, it had become more difficult for CSOs to attract active members. The impact of the economic crisis on everyday life of Cypriots, the lack of free time, and changing priorities may explain why active membership and voluntarism are decreasing. A large number of the Greek Cypriot engages in social activities related to family, relatives and friends, rather than in formal CSOs. There is a moderate number of CSO actions dedicated to protecting the environment. A significant percentage of population considers the role of civil society in protecting the environment as ‘significant’. Environmental standards are a rather new idea and somewhat unknown in Cyprus. However, organisations practice some environmental actions such as recycling, water waste reduction and energy saving, without having formal written policies. The low extent of engagement, both social and political, reflects the presence of a small group of individuals who are active in civil society. Overall, 10.2% of citizens are active members of one or more social CSO and 11.7% are active members of one or more political CSO. A majority of people believe that civil society played a moderate or significant role in the protection of the environment. Family continues to be at the heart of social support mechanisms and there is a lack of interest in developing more formal, institutionalised support networks. Historically, neighbours and fellow villagers contributed to this mechanism as well; however, following urbanisation, socio-economic development, and changes in lifestyles, alternative mechanisms and networks (such as civil society that provides social services) have still not developed. A slightly larger portion of the population is choosing to participate in various collective actions as individuals, without associating themselves with any particular organisation. This explains the occurrence of mass demonstrations joined by tens of thousands of people despite low levels of participation in CSOs. This could be reflecting people’s lack of trust in CSOs or their unwillingness to make long-term commitments and investments in an organisation or a cause; rather, they are choosing to make one-time articulations of interest at critical turning points. According to OECD there are only 3 environmental taxes in Cyprus, 2 regarding fuel and vehicles, and 1 regarding the use of natural resources. There are also 4 environmentally motivated subsidies, with the purpose to: reduce CO2 emissions by providing incentives to consumers to buy environmentally friendly vehicles; provide grants for mitigation of environmental damages caused by quarrying; stimulate industries and service sector to invest in cleaner production technologies and provide incentives for investments in energy savings and alternative energy sources. The Energy Efficiency National Action Plan 2007 aims at implementation of certain measures in households, industry, and transportation in order to minimize energy consumption and increase energy efficiency. There are certain measures applied regarding the promotion of Renewable Energy Sources and Energy Saving Mechanisms, as well as horizontal measures such as educational programs, awareness campaigns, etc. The National Action Plan for Green Public Procurements: Resource efficiency is tackled through a number of measures including purchasing of green products. Aims at increasing environmental criteria for public purchasing in order to minimize environmental impacts and increase financial sustainability. The GPP Action Plan is about promoting green products and services in government. The National Strategy for the update of management processes of Municipal Solid Wastes until 2020 aims at reducing waste and increasing waste recovery and recycling. Action Plan for the support of Public Transportation aims at minimizing fuel consumption as well as CO2 emissions and increasing resource efficiency. Waste Management Strategy aims at the promotion of recycling and recovery and sets the basis for waste prevention. Albeit on a decreasing path, the share of environmental taxes in GDP in Cyprus (2.9 %) is still above EU-27 average. This is mainly due to the large share of transport taxes (1.3 % of GDP), which is twice the EU-27 average. Revenue from energy taxes has doubled since 2000 as a proportion of GDP, but has been trending downwards in the past few years, just like the deflated ITR on energy. When assessing CSR in this society one has to note that, according to official figures, 95% of all enterprises in Cyprus employ less than 10 persons and 99% employ less than 250 persons. In essence, the economy of the island is dominated by very small units and ‘corporations’ are few. This feature of the economy has obvious implications for the way CSR is understood and practiced. To put it simply, CSR presupposes corporations and corporations are few in the country. A study has shown that of the ten largest corporations, only the three major Banks appear to have a planned annual CSR policy. The activities carried out by these three Banks as part of their CSR policy range from health services, to culture, major charity events to environmental and educational initiatives. The remaining companies contribute to charities and cultural events on an ad-hoc basis and they did not seem to have a systematic CSR policy in place. In conclusion, examples of CSR are rather limited. CSR is not a widespread notion in the southern part of Cyprus and it is doubtful if it will ever become entrenched in private companies’ agendas. However, even though the majority of companies state that they do not have a CSR policy in place, most of them donate on an ad-hoc basis. CSR in the context of northern Cyprus may seem to be an insignificant issue, since the ‘public’ sector is relatively large in the overall economy, and there are very few large corporations or industry. However, in recent years local corporations have been developing with unprecedented levels of economic growth. In general, corporate social responsibility is not very high. On environmental issues corporate responsibility was notably low, but corporations did play a role in supporting the arts, as well as book publications. With respect to responsibility to the community, only 4 out of 10 corporations were found to have carried out any act of responsibility. It is mainly the service CSOs which receive the highest figures of donations. Most companies, even if they are large in scale and profitable, still think that not much falls on them in terms of supporting the civil society activities in the country. Furthermore, most companies do not have a written policy on CSR and institutional structures on this matter are very few. However, compared to the previous decades, the private sector in Turkish Cypriot community has a higher degree of awareness on CSR but still has a long way to go for having a healthy relationship between the private sector and civil society.